Marc de Maar (UnitedHealthcare) took the biggest victory of his season so far as he escaped a 23-man breakaway to win the fifth stage of the Tour of Britain in the city of Stoke-on-Trent. The Curacao champion attacked with just over 6.5km of the 147km stage to go, having only recently returned to the group after coming down on a corner, and - since he was of no danger to the rest in the general classification - the rest of the group hesitated and let him go. Sep Vanmarcke (Garmin-Sharp) won the sprint for second place, 15 seconds behind de Maar, ahead of de Maar’s UnitedHealthcare teammate Boy van Poppel. “It was a bit of a tough stage today, in fact it’s been a bit of a rough week for me," de Maar explained afterwards. "I started off in crashes on the first two days so I kind of lost my motivation because I came here to do something in the GC but luckily my Team Director coached me through the last few days as I was almost thinking of going home but luckily I didn’t as I won a stage today. "It took some effort to stay away but as soon as the finish came closer I started to believe in it and all of a sudden I had some extra percentage to put on my pedal," the Curacao champion explained. “I am really proud of myself,' he added. "Still can’t believe it, too much excitement going on but I am sure we’ll get back to the hotel and realise what is going on." The bulk of the peloton finished more than six minutes behind the breakaway group, with gold jersey Mark Cavendish (Team Sky) even further back, having been dropped on the Staffordshire hills. Stage two winner Leigh Howard (Orica-GreenEdge) was part of the group, finishing fifth, and took over the race lead. “It was hard. It certainly wasn’t our aim to reclaim the jersey today, we wanted to win the stage," said the Australian afterwards. "That’s what we’ve come here for, just to win stages. I have no illusions that I will stay in the leader’s jersey until the last day. The real climbers, when they come out to play, are a class above the rest of us sprinters so I was just lucky today that I had good legs and could just stay with them until the end. “I’ve looked at the profiles [for the next few stages] and I’ve got no illusions that we’ll keep this until the end," he conceded. "We took another blow today, losing another rider in an early crash [Brett Lancaster - ed], so we’re down to four riders now and it’s going to make it hard. After a fast start, Howard took the first intermediate sprint, in Stone after 7.3km, to move three seconds closer to Cavendish’s overall lead; cutting the deficit to just three. Luke Rowe (Team Sky) finished second to the Australian, moving into overall third place outright, with Russell Downing (Endura Racing) third. Jan Barta (NetApp) led over the 2nd category climb of Glacial Boulder, Cannock Chase, ahead of former Olympic champion Samuel Sánchez (Euskaltel-Euskadi), mountains leader Kristian House (Rapha Condor) and Russell Hampton (Raleigh-GAC) but, shortly afterwards, the first three riders of the break got away. Ivan Basso (Liquigas-Cannondale), Bernard Sulzberger (Raleigh-GAC) and Bartosz Huzarski (NetApp) were 2’15” clear at the 50km point, but Team Sky pegged them at this to prevent them from getting too far away. The trio was still 1’55” clear after the two intermediate sprints in Uttoxeter and Rocester but, as the road began to rise on the 2nd category climb to Oakamoor with around 80km covered, Sulzberger was unable to stay with the other two. As the peloton hit crosswinds on the climb it began to split, and the front part bridged across to the leaders. Once the riders had gone, with all of the big teams represented, there was very little resistance from the peloton. Joining Basso and Huzaski were Basso’s Liquigas-Cannondale teammate Damiano Caruso, Huzarski’s NetApp teammate Leopold König, Paul Voss and Jonathan Tiernan-Locke (both Endura Racing), de Maar, van Poppel and Chris Jones (all UnitedHealthcare), Christian Knees (Team Sky), Jérémie Galland, Yannick Talabardon, David Leleay and Jérôme Coppel (all Saur-Sojasun), Vanmarcke and Nathan Haas (Garmin-Sharp), Sánchez and Pierre Cazaux (both Euskaltel-Euskadi), Howard, Jacek Miajko (Vacansoleil-DCM), Josh Edmondson (Great Britain), David Clarke (Node4-Giordana), Sam Bennett (Irl) AN Post-Sean Kelly. The remains of the peloton behind did not contain gold jersey Cavendish however, with the World champion struggling across the Staffordshire hills; the World champion’s teammate Bradley Wiggins was among those to drop back to help the Manxman. With 20km to go the group was more than four minutes ahead of the peloton, with Cavendish’s group 8’10” behind, and with 15km to go the attacks began. Vanmarcke was the first to put in a big move, but he was caught by Caruso and Knees, and the UnitedHealthcare riders in the group brought it back together. Voss misjudged a corner with nine kilometres to go and went straight on between the spectators at the side of the road. The German brought down De Maar and Galland as he dis so; De Maar and Voss managed to get back up to the group, but Galland stayed down, signalling that he had fractured his collarbone. With his teammate abandoning the race behind him, Coppel put in an attack, but this was countered by a similar one from Haas. These two were pulled back but, with 6.5km to go, de Maar - having chased back onto the group - jumped away and, with the rest of the group hesitating, was away. 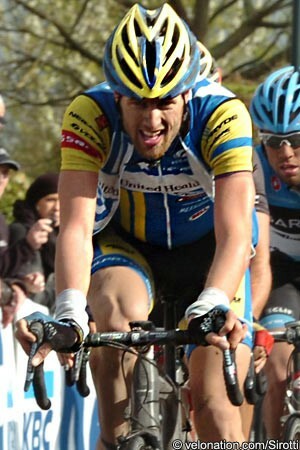 Voss and Basso led the chase but the Curacao rider was holding his lead; with three kilometres to go his lead was 11 seconds, and was rising. Under the flamme rouge with one kilometre left de Maar was 18 seconds clear of the group. Having worked so hard for his Endura Racing team leader, Voss dropped off, and Tiernan-Locke took over; the British rider was making no progress on the leader however. Into the finishing straight, de Maar pulled his rain jacket from under the front of his jersey - which would have spoiled his victory photo - and raised his arms as he crossed the line. As the group arrived 15 seconds later, Vanmarcke was strongest on the uphill straight to take second place, just ahead of van Poppel and the rest. Russell Downing (Endura Racing) led the peloton home, 6’30” behind, while Aidis Kruopis (Orica-GreenEdge) led the Cavendish group across the line after 11’45”. This was far from the last of the field however, as Kruopis’ teammate Michael Hepburn led the grupetto in after 25’14” had passed.